Mistletoe enforces a strict separation between its data-model layer and its presentation layer. The data-model layer as found in mistletoe-core module is reponsible for running a user-specified test suite and the presentation layer is responsible for presenting the results. At this time, two distinct and independent presentation layer implementations exist, namely mistletoe-servlet and mistletoe-wicket. Mistletoe-servlet is based only on the javax-servlet API in order to minimize the number of dependencies in your applicaiton. Mistletoe-wicket, as the name indicates, is based on the wicket framework. It assumed that you are already familiar with junit and in particular with defining junit test suites. There is plenty of documentation on the subject. For the sake of completeness, here is a very short introduction on the subject. Formally speaking, the ATest class is a test suite in itself, because since it contains the test cases a0 and a1. The CombinedTest class shows how you can combine two test suites to create a larger one. If desired, CombinedTest could be inserted into an even larger test suite. After you have created an appropriate test suite for integration testing purposes, mistletoe can run it for you and present the result in a web-page. The results can be presented by either mistletoe-servlet or via mistletoe-wicket modules. The mistletoe-servlet module is a offers a single servlet, namely MistletoeServlet, which can be used to run test suites. Installing MistletoeServlet consists of adding the following artifacts onto the class path of your web-application. In addition, you need to add the following lines in the web.xml file of your web-applicaiton. MisetletoeServlet requires several images which need to be added to your web-application, under the images/ folder. These images ship with the mistletoe distribution under the mistletoe-test/src/main/webapp/images/ folder. Forgetting to add these images wil lead to visually unsatisfactory results. After you have added MistletoeServlet in your application, point your browser to the location where MistletoeServlet is located. You should see a page aking to the following. You can instruct this servlet to run any test suite included in your applicaiton and report the results. That's all there is to it. 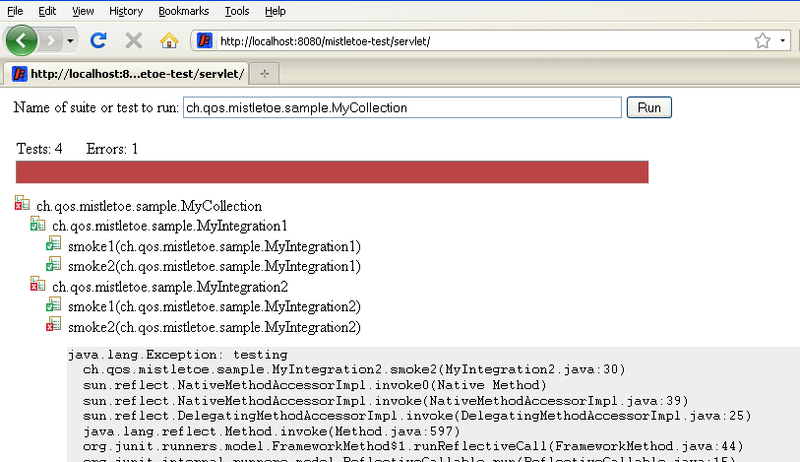 Keep in mind thatMistletoeServlet can only be as useful as the information provided by your test suite. The mistletoe-wicket module provides a component called TestReportPage which can be used to run any test suite and report the results. If your application is already wicket-based, then all you need is to add mistletoe-core-0.3 and mistletoe-wicket-0.3 onto the class path and then add link to the TestReportPage in your wicket-based application. 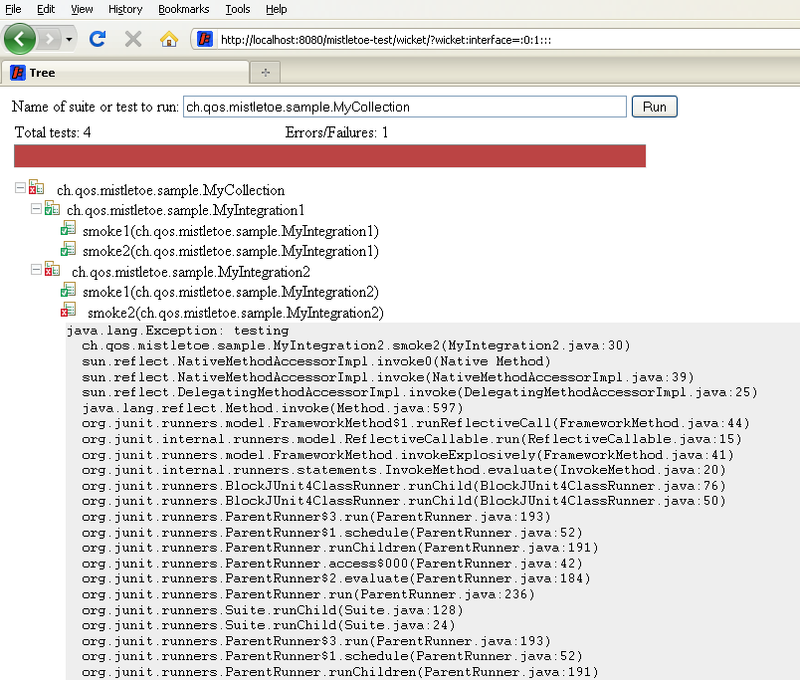 Clicking on the link you have defined will allow you to run any junit 4 test suite and see the results as a web-page. If you would like TestReportPage to propose a default test suite to execute, then add the following lines to the element defining the wicket filter in your application's web.xml file. Here is an example. If you are not using Wicket but would like to benefit from the capabilities offered by mistletoe-wicket, then here are the steps you need to follow. Add the following artifacts on to the class path of your application. Add the following class to you application. Add the following XML snipper to the web.xml file of your application. After you have configured your application as described above, point your browser to the appropriate location. For wicket-based application the location will be that of the link you defined for TestReportPage. For a non-wicket-based applicaiton, the url would be http://hostname/appname/mistletoe/ where http://hostname/appname/ stands for the url prefix of your applicaiton. You should see a page akin to the following. The resulting page is similar to the one produced by MistletoeServlet but the wicket version is interactive as you can collapse or expand entire suite trees.